Asparagi alla milanese, or Milanese asparagus, might just be the best known asparagus dish in the Italian repertoire. True to its Northern roots, it features butter and cheese, whose sweetness is the perfect offset to the somewhat astringent, slightly grassy taste of asparagus. A ‘sunny side up’ fried egg completes the dish. When eating, I like to break the egg yolk and allow it to run over the asparagus, making sure that each bit of asparagus I bite into has ample butter and cheese and egg yolk… Dietetic it’s not, but it’s awfully good! While the asparagus are draining, take a skillet big enough to hold all your eggs and melt the butter in it. Fry the eggs gently in the butter. Regulate the heat to make sure the butter does not darken or (God forbid!) burn. (Although unorthodox, I like to add just a bit of olive oil to the butter to help prevent this.) As they eggs cook, spoon the hot butter over the whites of the eggs to help cook them on top. Season to taste. The eggs are done when the whites are just set and the yolk still liquid. While the eggs are cooking (they will only take a minute or two) arrange the asparagus on a heated serving platter. The traditional pattern is to arrange the asparagus stalks in a ‘star’, with the tips all pointed towards the center of the platter, which should, of course, be round and large enough to accommodate this arrangement. Personally, I find this a bit fussy (and the asparagus tends to lose heat this way) so I simply line them up more or less neatly on an oval platter. Then sprinkle the grated cheese, which you should grate at the last moment to retain its full flavor, all over the asparagus. It should look like a heavy dusting of snow that covers the asparagus more or less entirely. Then place your eggs on top of the asparagus and spoon the melted butter remaining in the skillet all over. The eggs and hot butter should melt the cheese entirely. Serve immediately, as this dish is at its best when it is still nice and warm. Asparagus comes in several varieties. Leaving aside white asparagus, which is wonderful but perhaps not ideal for this particular dish, the basic choice is between young, thin asparagus and the older, thicker kind. Either kind needs to be trimmed of the rather woody base: just line them up on your cutting board and cut off the bottoms, about where they begin to lose their green color. Thin asparagus (which I personally prefer) needs no more preparation. Older asparagus develops a tough skin, which should be peeled off. If in doubt, bite a bit of one of the stalks to see whether the skin is noticeably tough; if so, peel. The only slightly tricky part about cooking asparagus is that being essentially shoots, they have very think, tender tips (with very delicate buds on them), which need hardly any cooking at all, and rather thicker bases, which need a bit more time to cook until tender. The older the asparagus, the greater the difference between tip and base. Younger, thinner asparagus can be made two other ways: the modern method is to lay your asparagus out flat in single layer in a a skillet filled with boiling water, which has the advantage of being quite fast. (The inch or two of water will come quickly up to the boil, especially if you’ve covered your skillet, and will return to the boil quickly as well.) Or, using a more traditional method, you can tie your asparagus together with kitchen twine and boil the bunch in a lots of well-salted water in a large pot. This takes a bit longer but tying the asparagus together makes things a bit easier when it’s time to remove the asparagus from the heat. It hardly needs saying, but, of course, like so many simple but exquisite Italian dishes, success will depend largely on the quality of your main ingredients. The asparagus must be impeccably fresh—the stalks firm, with their buds intact and tightly gripping the tips. The cheese must be real parmigiano-reggiano, preferably freshly grated while your asparagus is cooking. And if you can find butter from a local dairy farm, well, you’ll be experiencing the dish at its very best! * Most recipes for Milanese asparagus will call for a lot less butter and cheese than I do here. I like to ‘overdo’ these rich ingredients, but leaving behind any butter I feel I don’t need in the skillet, and sprinkling only as much cheese as I feel like using. (Excess butter needs to be thrown out, but the excess cheese can be used another day.) Better to have more than you need on hand than too little, I say! But, of course, you can hold back on both ingredients if you like. 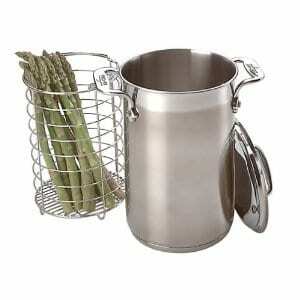 While the eggs are cooking (they will only take a minute or two) arrange the asparagus on a heated serving platter. The traditional pattern is to arrange the asparagus stalks in a 'star', with the tips all pointed towards the center of the platter, which should, of course, be round and large enough to accommodate this arrangement. Personally, I find this a bit fussy (and the asparagus tends to lose heat this way) so I simply line them up more or less neatly on an oval platter. I grew up on this dish. My grandparents are from Piemonte and Lombardy; my grandfathers were chefs. This is my spring breakfast when asparagus is out in the markets. I aspire to grow my own soon. Thank you for your wonderful blog. FRANK, THANKS AGAIN, IT SHOWS THAT SEMPLICITY GOES HAND IN HAND WITH THE BEST ITALIAN FOOD NO MATTER FROM WHAT REGION, PEOPLE SHOULD TRY WHEN GETTING HOME FROM A VERY HARD DAY´S WORK TO GET IN THE KITCHEN, HAVE A NICE GLASS OF WINE AND FORGET THE OUTSIDE WORLD EVEN IF IT IS ONLY FOR A FEW MINUTES………….WILL SAVE A LOT OF MONEY AND WILL GAIN IN HEALTH..GOD BLESS AND KEEP SENDING US YOUR LOVELY NAD MOUTH WATERING RECIPES. I bought some stilton cheese for this yummy recipe! Thanks! Anything with a fried egg on top is worthy of main course status, in my opinion. There is (almost) nothing not improved by it. I love this flavor combo. Frank, the theory about snapping v cutting is that the asparagus will snap at the exact spot on the stem where it becomes tender. This makes it easier to judge than cutting as differing stems have differing lengths of tender stalk. We often have mixed bundles with varying sizes which are really hard to judge. Buy the way much of our supplies come from an orchard which was once an asparagus field so I suppose it could be considered wild!!!! I think this sounds like tomorrow's dinner. I never boil asparagus. I braise them in a skillet with a little olive oil. Thanks everyone for stopping by and leaving a comment! And for those of you who are thinking of trying this dish, do let us know how you like it! @MomChef: I think you're right on the money. Funny to think how the same basic ingredients (eggs and butter) can produce such different results just by changing technique and adding a different 'accent' (cheese vs. lemon)! @jetset WISDOM: Do let me know how you like it! @Greg: Eggs and asparagus get along famously! Let me know if you like them this way. @Claudia: If you do try it, let us know how you like it! @Dianeuk: I've heard about that advice (snapping vs. cutting) but never understood why. Any thoughts? @Diethood.com: Bacon and cheese sounds awesome as well. I'll have to try it that way soon! @Drick: Steaming is definitely the best way to go. And if you try this, do let us know how you like it! @Spicie Foodie: You're so right. @whitneymc2008: That may be the best review I've gotten so far this year! Aiden LOVED this! That's sayin something if a 4 yr old sais YUMMY! Thanks! I've never tried asparagus this way, but I have to tell you that it's making my mouth water. I would also like it as a light dinner with a crusty baguette. This is one of my favorite ways of eating asparagus! Yum! Oh this sounds fantastic! I love asparagus, and I often make it with some bacon and cheese on top, but this sounds even better! I love the cheese and egg… yummo! Love the simplicity Frank. This dish is perfect as is, doesn't need any extra embellishments. Kudos to you for keeping its original beauty. Along the same lines I like to dip asparagus into boiled eggs instead of toast soldiers. By the way a lot of asparagus is grown where I live and we never cut it but snap the hard part from the tender. It will naturally snap at the right place. I often make asparagus with chopped hard boiled ggs and herbs and drizzle of olive oil as a topping – the fried egg with a runny yolk is seductive. This may be tomorrow's lunch! Oh precious precious – this is gorgeous and elegant. Should definitely not be relegated to anything but center focus. I poached an egg and served it on asparagus the other day. I will have to try this with the butter and cheese. C'e bello!!! Domani, proverei! Today, I'm into fresh farm eggs poached on lean ham and lots of garden arugula. Hollandaise would be a great add-on…but trying to eat simple! Non lo stesso, ma ci sono similar! You can't see my happy dance, but it's because I just bought asparagus yesterday. Really, this dish is asparagus with a deconstructed hollandaise sauce, isn't it. Perfect. Absolutely perfect.